The report, titled Toward a Reskilling Revolution: A Future of Jobs for All, reiterates U.S. Bureau of Labor and Statistics findings that 1.4 million jobs in the United States will be disrupted or lost to automation and other factors between now and 2026. Of those, according to the World Economic Forum’s research, 57 percent will belong to women. 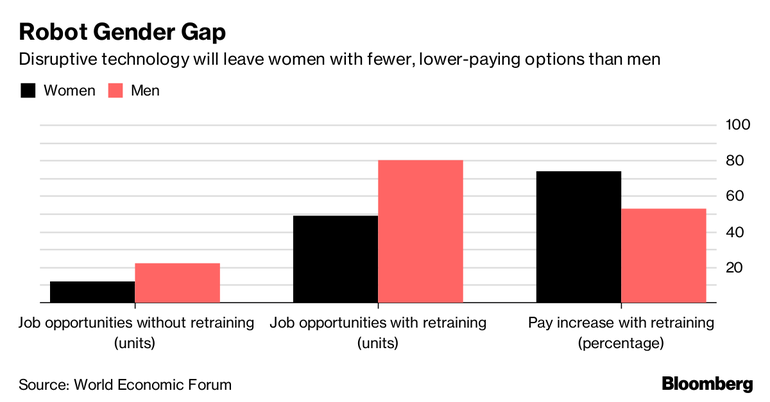 “This is a worrying development at a time when the workplace gender gap is already widening and when women are under-represented in the areas of the labour market expected to grow most robustly in the coming years,” according to the authors of the report.